I use a pedometer as a reality check. I often go home tired after a day in surgery or in the office. I'm tired so I must have expended a lot of energy and therefore used a lot of calories/done a lot of moving right? Wrong! In the course of a "normal" day most adults take anywhere from 900 to 3000 steps in a day and not much more. That means to truly get "enough" physical activity in daily, I (and you) need to go for that daily walk. Fortunately, I enjoy walking. Most days (barring horrible weather) I enjoy my walks with my dog. Other days--I just do it--rain or cold or heat. 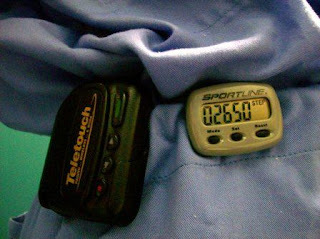 This is a picture of my pedometer with my step count on a surgery day. 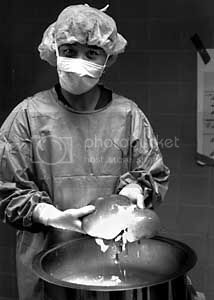 It includes the time from getting dressed to just finishing in the operating room. Notice how few steps have been taken. JAMA recently had an article (referenced below) that showed "The results suggest that the use of a pedometer is associated with significant increases in physical activity and significant decreases in body mass index and blood pressure." Overall, the pedometer users increased their physical activity by 26.9% over baseline. The person who gets the most out of the use of a pedometer is the who has a step goal (ie 10,000 steps per day). The JAMA article also found "Pedometer users also significantly decreased their systolic blood pressure by almost 4 mm Hg from baseline. Reducing systolic blood pressure by 2mmHg is associated with a 10% reduction in stroke mortality and a 7% reduction in mortality from vascular causes in middle-aged populations; thus, it is critical that the effects of pedometer use on blood pressure be examined closely in future studies." Perhaps you might think about getting a pedometer for someone for Christmas or even one for yourself. It does not need to be an expensive one. I use the Sportline 340 (having lost a few, they cost less to replace). I never bothered to program in my step length. 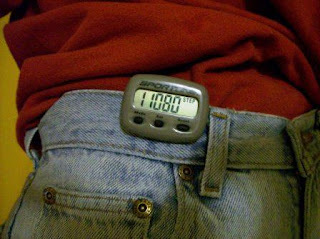 I simply use it to count the steps and aim for that 10,000 mark. Most days I go past it, but there are days I have to "work" at it. Simple adjustments will add up--park the car farther away from the store, take the stairs down two flights or up one rather than using the elevator, walk one extra block, etc. Start out by wearing the pedometer each day for two weeks and don't do anything to change your normal routine. Keep an exercise log of the daily step count. At the end of the second week, take a look at how many steps you are taking each day in the course of living your life. If you feel comfortable doing so, take the highest number of steps you have walked on any given day during that 2 week period. Use that number of steps (ie 2500 steps) as your first daily step goal. To avoid injury, do not select a higher number. Continue to keep your step log. At the end of that two week period, review all the steps you took each day. If you are ready, add another 500 steps to your daily goal. Your new step goal is now 3000 steps a day for the next two week period. Continue in that manner, working up until you finally reach the goal of 10,000 steps a day. The goal is to keep you active for the rest of your life. So don't go overboard and injury yourself. Take it slow. Take it easy. It takes about six months to "lock in" a new behavior. Aim to do what is necessary to change your exercise behavior permanently. Be prepared to dedicate yourself to your daily goal each day for a minimum of six months. If you do that, you are much more likely to maintain this goal permanently. If you skip a few days due to illness, work or other obligations, the sooner you get back into the exercise groove, the more likely you will be able to get back into your routine. 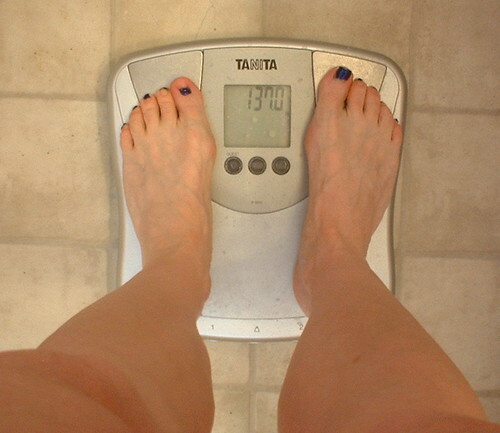 Reaching that walking activity goal of 10,000 steps does not mean that you can increase your food intake. Continue to try to eat a healthy and reasonable portion diet. So the weather's yucky, walk laps at the mall, go to a museum, or walk laps inside your home. Get up and move! Here's my total at the end of the day. Yikes! Now I gotta go and find my pedometer. Actually, I have to get back on my entire diet. Hey, I finally linked to you! I kept thinking I had already done it. Excellent exercise prescription. I think you're right, most people don't hit 10,000 without adding some deliberate exercise. Which just might be the point. I've been wearing a pedometer daily for well over a year. I shoot for 10,500 steps a day, even if I have to pace at the bus stop to make that goal! Anonymous, that looks like a good one. I use an inexpensive Sportline. I don't even bother to set my stride length. I just use it to count the steps. to help me cout the steps i take on my now daily walk. it reallyhelps keep me motivated. Around 1000 a day at them moment but better that the 100 or so i use to take! !